Rich and Famous Video Slot Review - Casino Answers! Rich & Famous is a 5-reel, 25-line video slot developed by WagerWorks, featuring a wild symbol, scatter wins and a bonus game. You can play the Rich & Famous video slot at Bovada. The Rich and Famous casino game is a nickel slot. Bets on the Rich and Famous slot machine are $0.05, $0.10, $0.20, $0.50, $1, $2, $3, $4, $5, $6, $7, $8, $9, $10, $15, $20, $25, $30, $40, $50, $75, $100, $150, $200, $250, $300, $350, $400, $450, $500, $750 and $1000 per line. You can select up to 25 paylines. The maximum total bet on the Rich and Famous slot game is $1000 per spin. The Rich and Famous video slot has an incredible betting range, allowing for play from casual players, high rollers and everything inbetween. 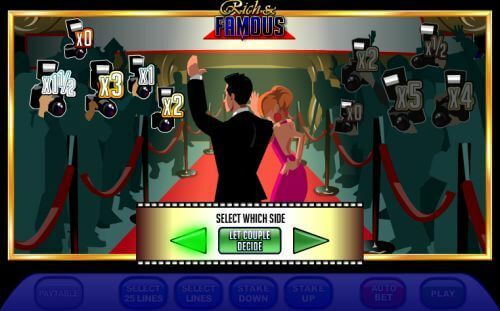 To select all 25 lines on the Rich and Famous slot game, hit the “Select 25 Lines” button. To spin the reels, use the “Play” button. The top-paying symbol on the Rich & Famous slot game is the Logo symbol. If you hit 5 Logo symbols on a selected payline, you will win the 10,000 coin top jackpot. The Logo symbol is wild and will substitute for all symbols except for the scatter symbol. The next highest paying symbol is the Celeb Couple symbol, which can pay out 1000 coins for five symbols. All wins are multiplied by the bet per line, except for scatters. Only the highest current win is paid per selected payline. All wins pay left to right, except for scatter wins (which pay any). Scatter wins are multiplied by the total bet for all lines. Rich and Famous doesn’t get a high grade for presentation, but it does offer a great top payout and a half-decent little bonus game with the capability to risk your winnings continuously to win more. You can play the Rich and Famous video slot when you sign up and make a deposit today at Bovada! Can American players play the Rich and Famous video slot for real money? No, USA players cannot play Rich & Famous for real money. We suggest that you read our Fame & Fortune Video Slot Review for a similar video slot or play it at Bovada. Where can I read more Hollywood-themed slot reviews? For more video slots like Rich & Famous, please read our complete list of Hollywood and Movie Slots. Is there a Rich & Famous flash game that I can play for free? 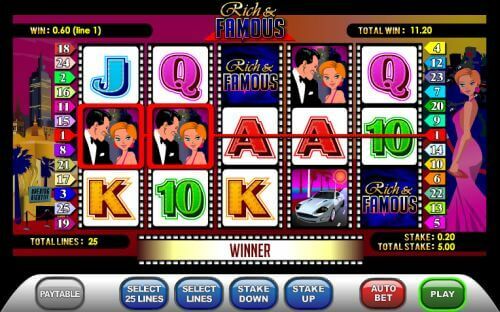 The Rich and Famous video slot is played in your web browser. You can play for free or real money. If you have issues with the flash casino, update to the newest edition of Adobe Flash Player.